Wargame reviews: Sagunto (SIMTAC), The War of The Union (CoA), Imperator (3W); The Spanish ulcer: capsule reviews of wargames simulation the peninsular war. Computer games: Harpoon. Two scenarios for Green Inferno (Alea 15). Non-wargame: Drácula, extension for Heroquest. Roleplaying: Far West, Analaya, play aid for Fuerza Delta. Miniatures: Command Decision (tournement rules), Ancients miniature gaming for beginners. The Shadow of the Eagle: the battle of Medellín, 1809. Tactical simulation of the peninsular war (know in Spain as Independence war. First installment of the Shadow of the Eagle series. 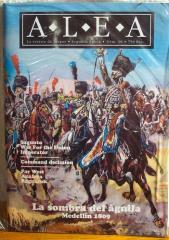 Escales: infantry battallions, cavalry regiments and artillery batteries. Complete simulation game that includes rules booklet, 1 DIN A2 map and 160 die-cut counters. Game design: J.A.Vargas Zúñiga. Complexity (1-10): 4. Number of players: 2.